Just off the heels of a successful outing in March to Microsoft Dynamics’ Convergence 2014 in Atlanta, i95Dev is pushing ahead by attending another Dynamics conference – Retail Realm on April 24-26 in glittering Las Vegas. Retail Realm, as the name implies, focuses on serving the retail industry and is expected to offer fresh new concepts in retailing technology. Retail Realm 2014 also provides an opportunity to learn directly from the Microsoft Dynamics team about the future of RMS, RMS Next Generation, AX for Retail and much more. The event solely showcases MS Dynamics solutions such as Retail Management System (RMS), Next Gen RMS, POS2009, and AX for Retail and related add-ons and technologies. 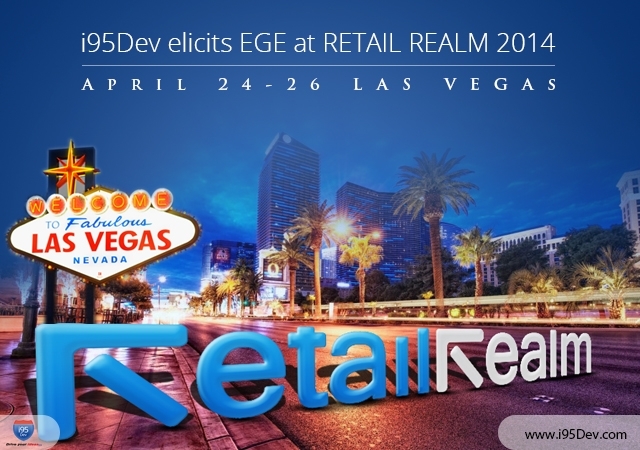 Retail Realm 2014 is centered on retail technology and offers a chance at a fuller understanding of the topic. The event shares the latest news and updates from Microsoft and the future of retail. The conference links the reseller network, solution providers, retail industry professionals, and retailers. For those eagerly awaiting the AX for Retail, the event offers an exhaustive educational session track. Catch one of our experts and learn more on how EGE can benefit your business multifold by bringing in Omni-channel experience, reaching a global market, building customer loyalty and increasing operational efficiency and sales.